UFO sightings and alien abductions, mystical experiences and psychic phenomena, the near-death and the out-of-body experience--millions of ordinary people around the world report experiencing these events at some point in their lives. Yet, because there is no accepted scientific theory to explain the paranormal, the events--and the people who report them--are ridiculed and dismissed. The problem isn't the people, it's the science. While some cutting-edge researchers and quantum physicists are speculating more frequently that these experiences are caused by something beyond our world--some kind of higher-dimensional reality--any proposed extra-dimensional theories put forth thus far have lacked one key ingredient--expanded consciousness. 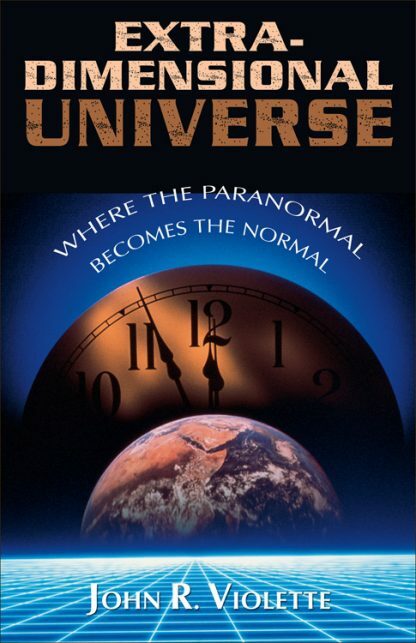 Extra-Dimensional Universe presents an expanded framework of space, time, and consciousness. This, for the first time, explains how paranormal phenomena can exist. Violette's landscape-altering theory is fully compatible with all the findings of modern scientific research--and ancient wisdom traditions--and clearly explains the science of paranormal events such as UFOs and abductions, mystical and psychic phenomena, and the near-death experience. Violette even reveals that expanded consciousness is the key to understanding why some people experience psychic phenomena such as UFOs or ghosts when others don�t. An advancement of the classic theories of R. M. Bucke and P. D. Ouspensky, Extra-Dimensional Universe is itself destined to become a classic of the science of spirituality. John R. Violette is an independent scholar in the field of dimensions of space and space-time, who had a few profound paranormal experiences at an early age, and has since searched for an understanding of how such things could really "work" in a rational world. He lives in Fall River, Massachusetts.